While late summer may not be the time of year many of us think about heat recovery, the potential for energy savings in compressed air systems should be on our minds year-round. For those involved with the compressed air systems within International Wire Group’s facilities, energy savings is on their minds each day. This culture of continuous improvement has everyone on the lookout for savings wherever possible. The International Wire Group Bare Wire Division plating facility in Camden, New York. International Wire Group, Bare Wire Division is a leading U.S. manufacturer of bare copper and tin-plated copper wire products used to transmit digital, video and audio signals or conduct electricity. They are sold to a diverse customer base of insulated wire manufacturers and various industrial OEM's. Back in 2011 International Wire Group (IWG) completed a full compressed air piping system upgrade at its wire plating facility in Camden, New York, optimizing the piping for two different processes at two different pressures. This has allowed them to reduce delivery pressure to the lowest possible levels for the majority of the plant’s demand, this being air wipes in between the stages of their plating process. The upgrade has saved them over 400,000 kWh/year yielding cost savings of over $40,000/year. On its own, this piping upgrade and its results are a definite success. Phase 2 of the project later in the year was to replace the aging compressors with new, more energy efficient oil-free compressors. Doing so has provided an additional estimated savings of over 200,000 kWh and $20,000/year. Since the completion of Phase 2, not only have these combined system upgrades saved operating costs, they have provided years of continual uptime for plant operations. Yet, there’s more. IWG has been able to further increase their cost savings each year, while simultaneously reducing their carbon footprint. They made sure not to overlook something relatively simple yielding even more savings with Phase 2 of the project. Historically, the main source of heat at this facility was from a #2 fuel oil-fired boiler. Instead, IWG now utilizes an insulated wall plenum of their own design recovering the waste heat from their air-cooled compressors, saving them an estimated $27,000+/year. This is accomplished by offsetting their space heating costs during the winter months. This estimate is based on the average cost of #2 fuel of $1.94/gallon back when the project first started! The savings each season changes with the fluctuations in fuel costs, and last season IWG’s cost was around $2.12/gallon. If fuel prices are close to what they were last year, the offset stands to be nearly $30,000 for this upcoming heating season. The custom designed Kobelco KNW series oil-free screw compressors provide compressed air year-round, and space heating for 6 months of the year, at International Wire’s plating facility. All of the compressors are two-stage, oil-free rotary screw design. The average system demand calls for two fixed speed base load units, a 40 hp (178 cfm) and a 50 hp (228 cfm), to run constantly and the trim compressor, 100 hp (330 cfm) variable speed, adjusts its capacity as needed to meet the demand. Other than scheduled shutdowns, the plant runs three shifts so all three main units essentially run 24/7. A fourth unit serves as standby. Even with the base-load compressors running at reduced pressures, the three main compressors reject a combined total of over 300,000,000 BTU per month via 6,500 cfm cooling fans in each unit. IWG has been able to consistently recover enough heat in the winter months, so the compressors are now the primary source of heat for the majority of the facility. While there is still supplemental heat in certain parts of the plant and they also continue to recover heat from their wire drawing emulsion fluid, the aging boiler was able to be removed from service entirely. This freed up floor space for storage and production. 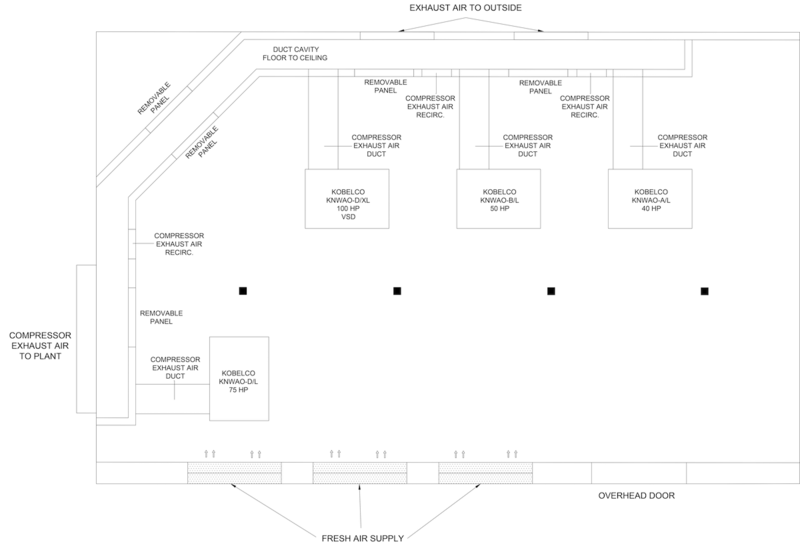 The compressor room layout at IWG’s plating facility. Click here to enlarge. Coming up with the wall plenum was necessary for IWG’s project team, given the room’s height constraints. It has worked out well since being installed. Built out from the corner of the room, the compressors all feed their discharge air into the plenum. Motorized dampers are used to allow warm air to be delivered to the plant during the winter months and vented to the outdoors during warmer months. The custom designed rear discharge on each Kobelco KNW series compressors. Custom insulated wall plenum directing air into the plant during winter months and to the outdoors during summer months. Like many compressed air equipment upgrades, bringing Phase 2 of the project to a successful completion had its challenges. With a height as low as 7 ft. in places, the room was not conducive to standard air-cooled compressors, discharging vertically. The exterior doorway was also too short to easily rig the equipment into the space. In working with its local supplier, D&W Industrial (Auburn, New York) and Rogers Machinery Company, the manufacturer of the compressors, a solution was devised. Hoyt recalls the room dilemma and solution: “The low ceiling height in the compressor room presented a challenge to the installation. Since the compressors are designed to discharge exhaust air from the top, it would have been impossible to install them in this location without making modifications. After speaking with the engineers at D&W and Rogers Machinery, the most feasible option was to redesign the compressor’s exhaust to discharge from the rear. This would enable them to be installed in the desired area, and allow us to effectively recover the (warm) exhaust air to offset our heating costs during the winter months. The staff at D&W and Rogers Machinery were able to provide a design that was suitable for our application.” The compressor package design was also customized to allow for partial disassembly/reassembly for rigging into the room. The cooling fan in each unit is also sized to handle the additional external static pressure from the ductwork and plenum. By completing the heat recovery portion of their overall compressed air system project, IWG has set a good example for other compressed air users who may have the potential for savings. Even though there were challenges, they adapted to the conditions, worked to overcome those challenges and continue to reap the rewards. Their example is a good reminder if heat can be recovered without causing operational or reliability issues with a compressed air system, it should be investigated further. With summer coming to a close and the heating season nearly upon us, now is the time to do investigative work to find what heat could be recovered, and what savings could be added to your company’s bottom line. For more information contact Brian Sorbello, Rogers Machinery Company, email: brian.sorbello@rogers-machinery.com or visit www.knw-series.com. To read more about System Assesments, please visit https://airbestpractices.com/system-assessments.